The weekend is upon us! Have you got some big cooking projects planned? We at MoFo Headquarters have been loving all the posts – from the crazy innovative stuff to the grand failures. And to thank you we plan to give you lots of prezzies! Starting with today’s giveaway from Little Otsu. Little Otsu is a vegan-owned publisher of comics, zines, cards and books. And they don’t put out crap, either – all of their stuff is beautifully designed. Even flipping through their books makes me lazy, everyone just puts so much work into everything. 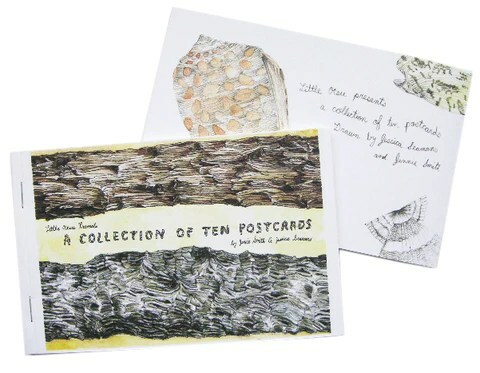 Today we’re giving away 3 giftpacks from Little Otsu, which include artist Allison Cole’s Tour Diary, along with Jennie Smith and Jessica Seaman’s postcard book. Look how beautiful they are! Vegan companies and vegan artists, Fridays and giveaways, these are all things that make us happy. Now to enter into the contest just tell us which VeganMoFo post has made you happy this week! Post a link in the comments and tell us why you loved it, and we’ll pick three winners at random, tonight at around 6pm EST. Please also check out Little Otsu’s site and keep them in mind for the holidays! I know I sound like an infomercial, but they have the cutest stuff that would make the bestest gifts. Edited: Winners have been chosen! Winners: please email VeganMoFoBlog@gmail.com with your name and address to claim your prize. Thanks for playing everyone, and look for more giveaways soon! ALL OF THEM. I LOVE YOU. MARRY ME PLZ. I loved reading about why she became vegan. And the soup looks CRAZY GOOD!! I can’t read it, but I really wish I could. Saw this recipe for peanut butter fudge this morning and I can’t stop thinking about it. Beetaroni! Need I say more? Tough call, but the PPK chickpea cutlet post (http://theppk.com/2010/11/doublebatch-chickpea-cutlets/) made me very, very jolly. Shelly’s ganache, and her two cents’ worth about vegan pâtisseries! I loved reading kara kara’s 4 posts from this week. Not only did she cook my fav meal ever, peanut soup, this week and make pumpkin empanadas extemporaneously, but she admits, in her oatmeal post, to being a “chronic overpourer” and is just overall a very great, very vegan blogger whom I admire. Because people need to use garlic even more! The vegan Violet Crumble. You don’t know how much I’ve missed them. Not to sound like a shameless suckup, but I loved Isa VS The Cookiepuss (http://theppk.com/2010/11/isa-vs-the-cookiepuss/). I’m allergic to milk, and “missed out” on those kinds of processed sweet treats when I was a kid. * I didn’t even know what a Cookiepuss was before reading your post, but now I know that I MUST HAVE ONE. He will be mine. Oh yes, he will be mine. Muahahaha! * of course, now I’m happy I did – as it made going vegan that much easier – hence the scare quotes. yay childhood traumas! I love the idea of vegan sisters! I’m really looking forward to trying out this crazy easy sounding beer bread recipe! Seconding the vegan violet crumble! I’m super excited to try that one. Madcap cupcake’s posts/theme for MoFo is fantastic…baking her way through a variety of vegan cookies in preparation for the holiday cookie season!!! Really tough call, but probably Vegan Brew’s Veganized Vlaamse Stoofkarbonaden (Belgian “Beef” Stew). The photos are so lovely, the recipe sounds DELICIOUS, and I’m so, so jealous of his Brussels sprouts harvest! It gave me hope that maybe my incipient sprouts will turn out half as nice as his. Hopefully before the snow flies. Mo’s cooking video has been my favorite so far! I’ve really been liking the posts over on http://awesomeveganrad.wordpress.com. Me too, I loved Wing it Vegan’s Beetaroni. The idea is so crazy I find it appealling. Swell Vegan’s Raw Persimmon-Apple Crisp, gotta represent Minneapolis vegans! i’ve had dia de los muertos on the brain all week, so i love the chocolate skull cakes! My favorite so far is HungryHungryHippies fudge and pb cups. Can never go wrong with those, but hers look soooo good! Definitely yesterday’s, Especially, Mr. Bran! i just love her excite of the upcoming month, and her pics from last year’s vegan mofo … well … it all looked dang-a-licious! I loved http://kitteekake.blogspot.com/2010/11/sambar-salivations.html which linked to http://tahinitoo.wordpress.com/2010/11/04/c-is-for-curry-leaves/. i love her excitement of the month starting and well, her pics of last year’s vegan mofo food look, well, dang-a-licious! The PPK chickpea cutlet post (http://theppk.com/2010/11/doublebatch-chickpea-cutlets/)! I even went to store today to by ingredients to make the dish this week!!! ❤ Isa, she's fabulous. her pics from last year’s vegan mofo make the mouth water, and i can’t wait to see what she’s got for us this year. Some hot, hot boots for the cold weather!!! I love Vegan Lazy Smurf’s exploration of the versatility of rice & beans. Cheap, healthy, tasty– it doesn’t get better than that! Ok great, I have randomly picked 3 winners! I’ve not read a lot of the entries, but this one stood out for me, because it was like reading what I’ve been thinking for so long, she put my thoughts across so much better than I ever could.